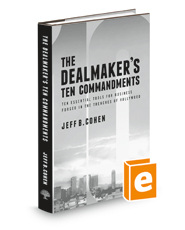 Published by the American Bar Association (ABA), The Dealmaker's Ten Commandments contains a practical, no-nonsense methodology for negotiating deals, managing your time, and handling crisis all at the highest level. Peppered with entertainment industry war stories, The Dealmaker's Ten Commandments have been forged in the white-hot crucible of brutal, transactional combat. Although developed in Hollywood, the real-world tactics, strategies, and guiding principles are vital for any business environment. With sufficient practice, incorporating The Dealmaker's Ten Commandments into your life becomes second nature. Opportunities that once were hidden become visible. Traps that would have snared you are avoided. Enemy vulnerabilities, which would have gone undetected, reveal themselves. The book is a toolkit, enabling you to overcome resistance, obtain your goals as a professional, and achieve the success that is living your life on your terms.